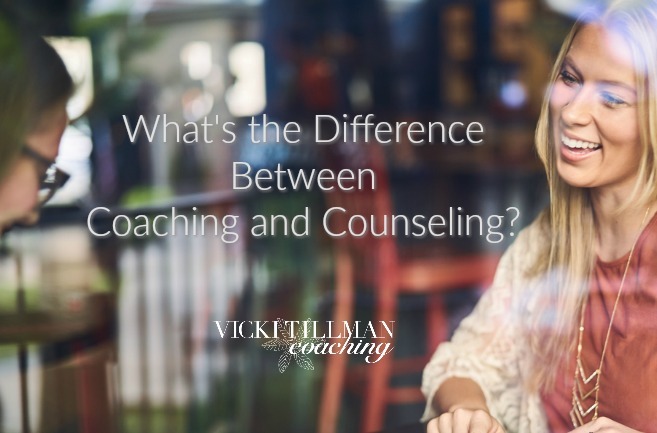 Ever wonder What’s the difference between coaching and counseling? When you work with a counselor, you are feeling sadness, anxiousness or other emotional/mental distress. You need healing. Counselors help you through the process of healing. Your coach walks with you through the process of fulfilling your growth process. Coaching is usually very non-directive. Your coach will ask you “powerful questions” that guide you through your own self-discovery process. Coaches are not consultants who tell you what to do (although they may suggest some resources for you to explore). Instead, coaches know that you already have your future inside you, it simply needs to be discovered. Coaching is SUCH a rewarding, life-changing experience. Don’t wait until you are desperate! Contact me to get YOUR coaching started! But if you already are desperate for a change, for becoming who God truly created you to be, hurry and contact me. Let’s get the coaching process started. We will work in person if you are local or by phone or Skype if you are not. Here are 3 painless, practical things to do when you feel overwhelmed. Ever feel like shutting down when you feel overwhelmed? I read a quote by Matthew Kimberley: Feeling overwhelmed is not because you have too much to do; it is because you don’t know what to do next. I agree. The feeling of overwhelm is often caused by having a lot to do and looking at that huge to-do list…then stopping because there’s not a clear starting point. Then nothing gets done, of course. Take some deep breaths, lower your blood pressure and your racing thoughts. Practice some mindfulness. Here’s a freebie with my favorite mindfulness, deep-breathing activity. This will clear your head. Really. Try it! Our minds will drive us where we tell it to drive us. In other words: If we tell our brains, “This is going to be a disaster!”, our brains will usually co-operate with that. If our brain expects an adventurous challenge with a FINE outcome, it will co-operate with that. In other words: Brainwash your brain with a positive truth statement rather than a negative, fear-mongering statement. Begin with the end in mind. What will it look like when you are successfully finished with everything? Now, look backwards to the half-way point. What will you have finished by that point? Now, look at the halfway point to the halfway point. What will you have finished by that time? Now, look at the halfway point to the halfway point to the halfway point. What will you have finished by that time? This gives you a good feel to the pacing you need. How much will you be needing to accomplish each day? What will be your starting point? Want more help getting life under control? Life coaching will help with that. Contact me to reserve a time to get started on a life free from overwhelm! Here are 3 reasons why courtesy is cool and makes you cool and employable. I was listening to a recorded lecture by the late poet John O’Donahue. This poet, priest and philosopher said something that caught my attention: He said that we needed to be “courteous to ourselves”. So my generation was real but many of us became *real* selfish, *real* harsh, *real* unkind, *real* ungrounded. Courtesy wasn’t enough if someone was *fake*. But no-courtesy had bad results, too. Now, many decades later, we are finding out that old-fashioned words like *courtesy* don’t actually have that much to do with the rigid systems of etiquette like we were taught by our parents. Rather, *courtesy* is a synonym for *kindness, compassion, thoughtfulness, virtuous practices*. AND it’s back! Here are 3 reasons why courtesy is cool and makes you cool… and employable. *Courtesy is cool because it is in the Urban Dictionary: a thoughtful gesture or action. Example: Don’t forget to do that courtesy thing I told you about before we came over. Who should you show courtesy to? *Friends and family! Here’s a simple way to put it: If what you are doing fits the instruction *be nice* it’s probably courtesy. Here’s one new thing to get started with: Confidence-building skills for meeting new people. Click here for this FREEBIE! Courtesy is cool. It makes you cool. And it helps you be employable. Make it a habit! If you’d like to work more on this, other job skills, or life transitions, contact me. We can coach in person, via phone or Skype. 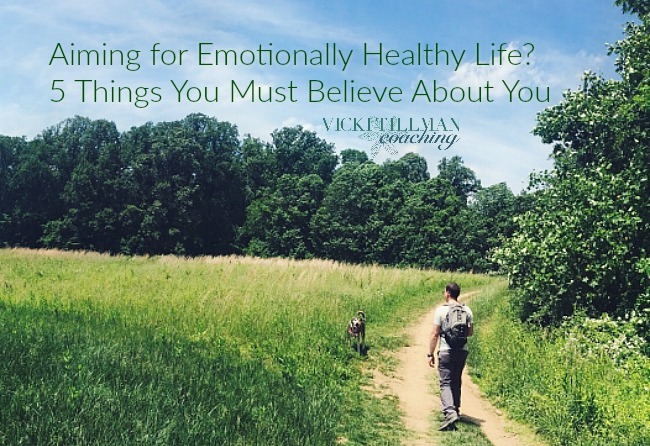 Are you aiming for an emotionally healthy life? 5 things you must believe about you. *Just because you still have areas to work on, doesn’t mean that you’re a failure. Wise people are introspective. They will take a look at the things that they are doing well, and those they are not doing well. However, emotionally healthy people will not take those introspective moments as opportunities for self-abuse. They will use them to set growth goals. *You have gifts that need to be unfolded. Every person has things inside them that need to be discovered, unfolded, developed, and enjoyed. No matter how long you live, there will be something that is in you to find out about. How do you discover gifts? Try new things, do volunteer work, join organizations that are creating good. As you are active and engaged in life, gifts will come to light. *Your God-given personality is a blessing to be developed and appreciated. God gave each person a personality (get it: person…personality). Wise people learn about themselves so that they can enhance the good parts and manage the weaknesses. The stronger people get in self-knowledge, the more they can be healthy. Do some personality exploration! Click image for free download. *You are loved by God. Wise people learn to simply rest in this knowledge. There are many things in the world that are painful and unexplainable. In the midst of all that, emotionally healthy people can be helped by the knowledge there is a God who loves, IS love and loves you in particular. *You were made for connection with God, people, God’s creation. Connection with God’s creation: God made it and said it was good. Don’t miss the emotional health that moments of awe inspires. Personal growth is the kind of work coaches do. Contact me. It’s worth investing in: 7 achievable ways to enhance your emotional health. Coaching clients often have emotional health as one of their goals. Even if they don’t define it that way because they don’t know what the heck emotional health is! What they are able to say is that they want to live a good life and feel fulfilled. In order to reach those goals, a person need emotional health. What is emotional health anyway? Emotionally healthy people have high personal Emotional Intelligence: They recognize, understand and manage their own emotions. Emotionally healthy people have high interpersonal Emotional Intelligence: They have the ability to recognize, understand and influence the emotions of others. Emotionally healthy people are resilient: They can bounce back from difficult circumstances (with help from others when needed). Emotionally healthy people have grit. They have perseverance and passion for long-term goals. Emotionally healthy people treat with the balance of compassion and assertiveness. Compassionate people notice other’s suffering and want to help. Assertive people know where to draw the line so that they do not fall into co-dependency. Emotionally healthy people treat themselves well. Emotionally healthy people find and engage in truth, beauty and goodness. Does that sound overwhelming? It’s not. 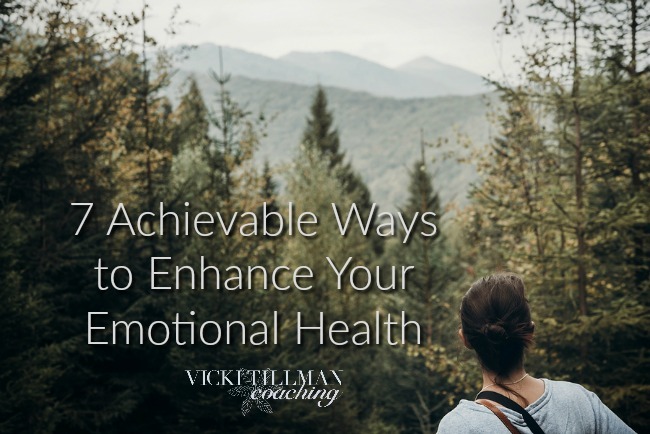 Here are 7 achievable ways to enhance your emotional health. For personal Emotional Intelligence, practice 3 W’s daily. Get a journal and once a day record: WHAT am I feeling? WHY am I feeling that way? WHAT am I going to do about it? For interpersonal Emotional Intelligence, practice perspective taking. In that same journal, record an interaction or event that happened that day. Now practice the 3 W’s from the other(s) perspective. Do your best (the more you practice, the easier it will become). WHAT were they feeling? WHY were they feeling that way? (What is their history/story/need/fear?) WHAT are you going to do about what happened? To build resilience. Talk to yourself about recovering from tough things (predict to yourself that you will recover). Create positive experiences for yourself. To build grit. Spend some time on self-discovery. Begin to pray about setting life-goals for yourself. To balance compassion and assertiveness. Do a good deed daily. Say “no” to people who take advantage of you. Treat yourself well. Start with some mindfulness and gratitude. 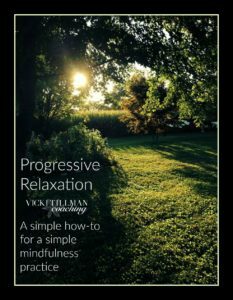 Here’s a link for progressive relaxation breathing- a simple mindfulness exercise, and a how-to for gratitude lists. Begin to expand your emotional health with “truth, beauty and goodness” by noticing God’s work each day. 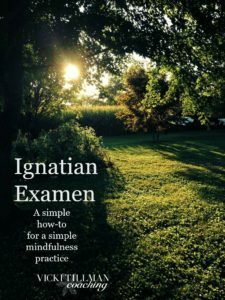 Here’s a link for my version of the mindful prayer exercise: Ignatian Examen. These are all achievable goals, but sometimes working towards ANY goal is easier and more fun when working with a coach. When you’re ready to work on your emotional health goals, contact me to get started with life or career coaching. Hey, and look at the sidebar and sign up for my newsletter. I’ll be sending out an email weekly for the next 7 weeks with a downloadable freebie to build on one of the 7 areas above per week. Enhance your emotional health! Sign up for the newsletter. 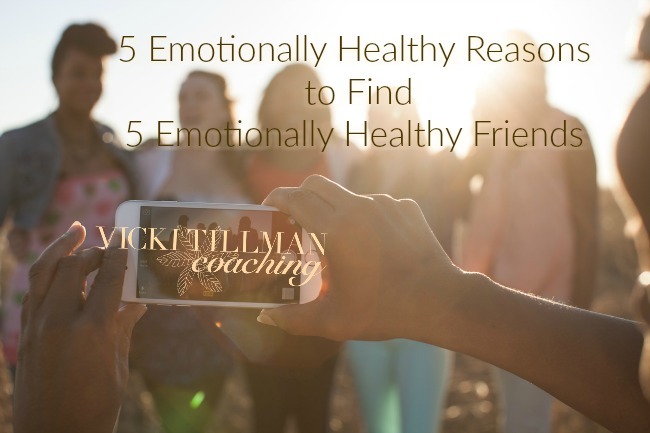 Here are 5 emotionally healthy reasons to find 5 emotionally healthy friends. Friendships are necessary for human health and wellbeing. If you want to truly want to live the “good life”, according to Aristotle, you need to have good friends. Friendship is usually not too difficult for extraverts, but even introverts need good friends…and by “good friends”, I mean “emotionally healthy friends”. Whether the people you are engaged with are online or IRL, the 5 people you are with most frequently are the people who will most influence your thoughts, decisions, beliefs and behaviors. Ever had one of those moments with a friend where you both have the same thought? Or maybe you both worked on figuring out a tough problem, then you came to a mutual resolution (an “aha” moment)? Or you listened deeply to one another and each of you felt heard? At those moments, you both did some rewiring of your brains…mutual rewiring. This increases both your brains’ neuroplasticity (your resilience and neural health). Healthy friendships help train our brains for empathy and prosocial skills…if we have emotionally healthy friendships. The opposite can also be true: emotionally unhealthy friends stimulate us instinctively toward their unhealthy behaviors. This is because our brains have “mirror neurons” that instinctively imitate the things we see other people do. Healthy friends contribute to healthy brains. Research shows that people who have a best friend at work are 7 times more likely to feel engaged with their job. Having good friends may help to reduce depression and anxiety levels over time. One recent study found that adolescents that have close friends as teens, had lower levels of depression and anxiety when they reached age 25. Teens with close friends also tend to have better self-worth as adults. Adults do feel better with friends, too. If you didn’t have many friends as a teen, now is the time to get started. What is emotionally healthy friendship? Celebrate when you have a success. Call you out on your garbage…but are not critical or belittling. Are mutual (able to invest support as well as receive support from a relationship). Where do you find emotionally healthy friends? Your significant other can count as one. Family counts (but not as all 5 of your friends). You can find friends at work or in various organizations. You can find friends in the digital world, too. Best wishes finding some great friends! You shall love your neighbor as yourself. Love works no ill against his neighbor. A little advice for these times: You shall love your neighbor as yourself. Love works no ill against his neighbor. 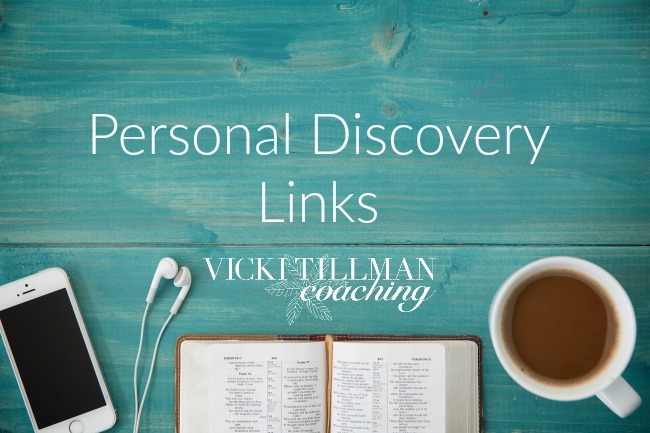 This post is running concurrently at Vicki Talks Prayer. 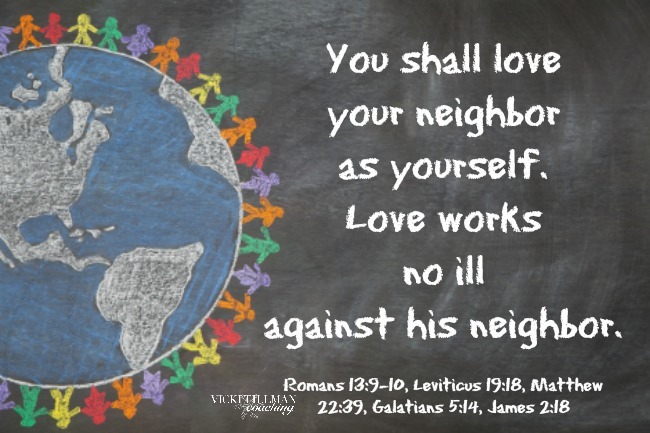 Romans 13:9-10 You shall love your neighbor as yourself. Love works no ill against his neighbor. Matthew 22:39 The second (commandment from Christ) is like the first: You shall love your neighbor as yourself. Galatians 5:14 For all the law is fulfilled in one word: You shall love your neighbor as yourself. James 2:18 Show me your faith without works (of love), I will show you my faith by my works (of love). If God says something ONCE, he means it. If he says it TWICE, you better not ignore it. If he says it 3 TIMES, you’re going to start getting “woe unto thee”. So if it is in Scripture more than 3 times? I’d say that was high priority in God’s eyes. If you’re wrestling with questions like these, I can help. Life coaching with a Christian perspective can help (I’ve trained at Liberty University and years of serving in prayer and teaching ministry). Contact me. For a glimpse at my prayer work, check my blog: Vicki Talks Prayer. 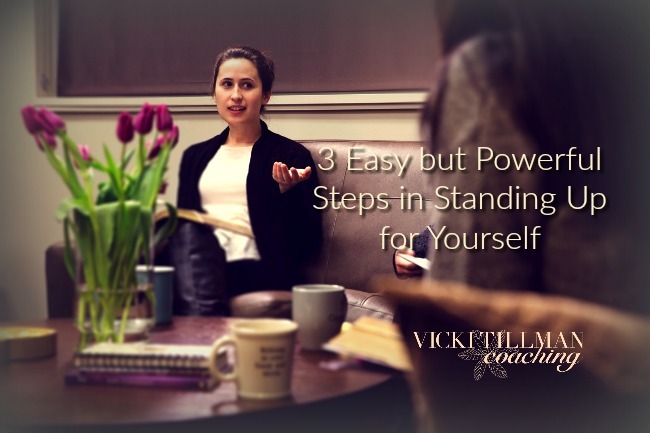 Here are 3 easy but powerful steps in standing up for yourself. Times come in everyone’s life: you have to stand up for yourself! Whatever the event, there are 3 easy but powerful steps in standing up for yourself. Step 1. Take a deep breath and lower your emotions. You lose your power when you yell. Did you catch that? You loose your power when you yell! The only thing that yelling does is put people on the defensive and when they are defensive they don’t listen. When they don’t listen, you’re powerless to make a change. Click here to learn deep breathing practices with this free download. Step 2: Use +-+. Plus-minus-plus is the 3- or 4-sentence magic formula in standing up for yourself. Plus: Say something polite or complimentary. ONE sentence. Even if you’re angry, you can do this. Saying something polite lowers the overall anger level in a room and helps the other person to become more receptive. Minus: Say what the problem is. ONE sentence. Then, what you would like done about it. ONE sentence. No demands, instead say something like, “What I would like is…” “What is need is…” “This will make things feel better…”. Plus: Something kind or complimentary. ONE sentence. Say something like “Thanks for listening…” “I appreciate the help”. Step 3: Step back, be quiet, create some space for the other person to do something healthy. Silence is a powerful tool. You might feel like talking on and on until you get everything out, but in a tense situation the person who is listening will probably not pay attention to anything after the 10th word. So really, you have 10 words to make your point (that’s the Minus section of your +-+). Then stop! You will have shown that you are a powerful person to be reckoned with. The other person may adopt your idea (and very often come out of a +-+ situation feeling like your idea is their idea). Even if you aren’t heard in this first round, you have opened the door for healthy negotiation. Give it a try! When you’re ready for more help learning to advocate for yourself, contact me for coaching in person or by phone. 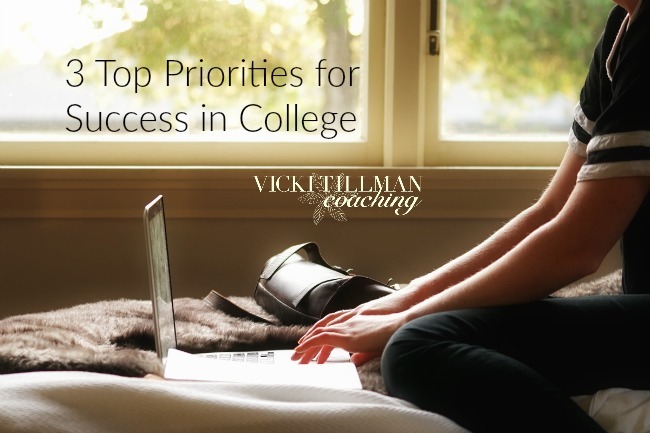 Here are 3 top priorities for success in college. People go to college for many reasons. Getting a job is usually one of them. Getting a job is one of your priorities, it is important to know that in these days, simply getting your degree may not be enough to land a job in your field. While this may seem obvious, I frequently guide college students in this very problem. You must pass your classes to get your degree. When employers look at your transcript and there are multiple fails, withdraws and C’s, they are inclined to think you may lack initiative (whether this is true or not). College is all about networking. 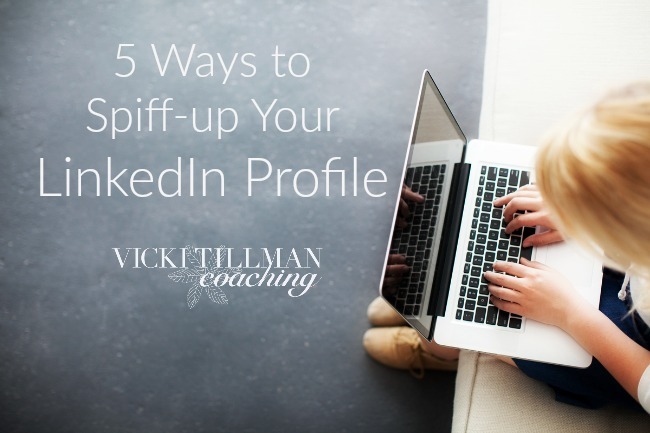 Who you know will open doors and/or get you job referrals later on. Don’t skip this! Students who do internships are more likely to get jobs. A study with the National Association of Colleges and Employers found that 60% of students who landed paid internships during college, landed jobs when they graduated. Not all internships are paid, but if you start early with unpaid, you are more likely to end up with a paid internship as an upperclassman. Keep an eye out in your departmental communications for internships of any kind. Also keep an eye out on the community, sometimes you will find an internship simply by keeping your eyes open in social media or job aggregate boards. When you need some guidance or coaching for college success, contact me.